He married in 1886, and in 1887 was appointed by Father Bernard Vaughan as organist of the Church of the Holy Name in Oxford Street, Manchester. By this time he was also acting as an impresario, staging concerts in Manchester's public halls, the Free Trade Hall and St. James's Hall. Income from these events, and from teaching music to private pupils, enabled the couple to move to a large house in Lime Grove, near the church, in November 1887. 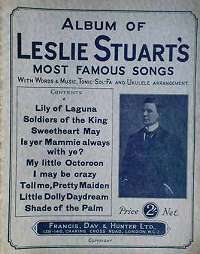 Soon afterwards, he began using the name Leslie Stuart for his theatrical work, supposedly to distinguish him from another performer, T.W. Barrett. While in Manchester, he had become acquainted with Charles Hallé of Hallé Orchestra fame (and another Cassidy subject), who worshipped at the Holy Name church and also gave played and organised concerts in the city. Indeed, Stuart claimed to have been a pupil of Hallé at one time. It is possible that Hallé suggested that the capital city was a better base; Hallé died in October 1895. Early in 1895, Stuart and his family re-located to London, where they lived 81 Albert Road, Battersea Park. In his time he achieved fame on both sides of the Atlantic as a composer of musical comedies, notably 'Florodora', and hit songs. While in America, among other achievements, he could claim to have discovered the young Rudolf Valentino, working as a dishwasher. In June 1927 he returned to his old home town of Manchester as 'a rather frail old man' and entertained audiences at the Palace Theatre with revivals of his best performances. From August to October 1927 the newspaper Empire News published a series of articles by Stuart about his life and times, which many years later were edited by his biographer Andrew Lamb into book form and published as My Bohemian Life. 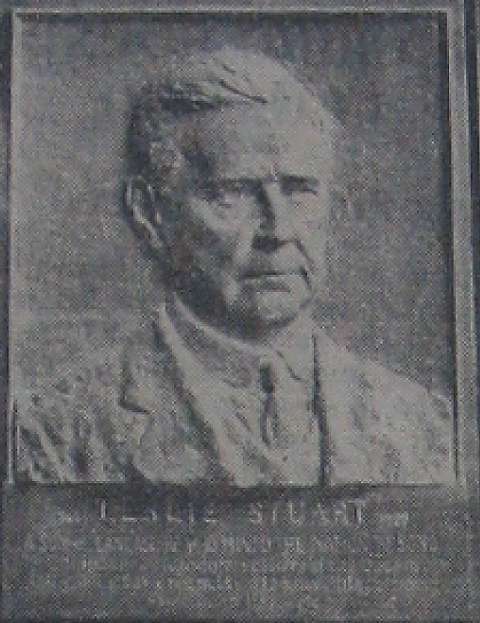 Leslie Stuart died of pneumonia on 27 March 1928, at his home near Richmond-on-Thames. Andrew Lamb, Leslie Stuart, Composer of Florodora. London: Routledge, 2002. Note: Dustjacket has subtitle The Man who Composed Florodora. Leslie Stuart, My Bohemian Life. Edited and Arranged by Andrew Lamb. Croydon: Fullers Wood Press, 2003. N[eville] C[ardus], 'Leslie Stuart'. Manchester Guardian, 28 March, 1928, p.6. 'Obituary, Alderman Joseph Toole.' Manchester Guardian, 5 June 1945, p.3. Leslie Stuart, British Musical Theatre website, part of the Gilbert and Sullivan Archive. A son of Lancashire who moved the nation to song. Composer of 'Floradora', 'Soldiers of the Queen', 'Little Dolly Daydream', 'Lily of Laguna', 'Little Octaroon', 'Sweetheart May', etc. In May 1938 Alderman Joseph Toole, Deputy Lord Mayor of Manchester, announced a subscription for funds for a plaque to commemorate Leslie Stuart, On April 12, 1939, Toole presented the resultant bronzed plaster plaque for exhibition in the Henry Watson Music Library. Designed by John Cassidy, it was duly hung in the second floor corridor of Manchester Central Library, but was eventually vandalized and damaged beyond repair. - Andrew Lamb, Leslie Stuart, Composer of Floradora, p. 263. On behalf of the Manchester Corporation Town Hall Committee, Councillor Ellis Green (the chairman) yesterday accepted the gift of a bronzed plaster plaque, executed by Mr John Cassidy, of the late Leslie Stuart, the popular Manchester composer, which will be offered to the Libraries Committee for exhibition in the Henry Watson Music Library.' - Manchester Guardian, 13 April 1939, page 11. 'But I thought John Cassidy was retired', several people have said to me this week following on pictures in the newspapers of Mr Cassidy's plaque of Leslie Stuart, newly placed in the Manchester Town Hall. The answer to this explanation is that Mr. Cassidy has been retired for some years, but was eager to do the plaque of his old friend Stuart. John Cassidy, who knew Leslie Stuart nearly all his life, is now approaching 80. Not that you'd guess it. He is remarkably fit and has recently moved to new quarters in Albion-Road, Fallowfield.' - Evening Chronicle, Manchester, 15 April 1939. The extracts above tell the story of what was almost certainly Cassidy's last public work, and public appearance before his death in July 1939. How Cassidy came to know Stuart is not known for certain, but both were Roman Catholics living and working in the Chorlton-on-Medlock area around the same time, and it is likely that Cassidy attended the Church of the Holy Name of Jesus, opened in 1871 and Manchester's largest Catholic church, on Oxford Road, while Stuart was organist. 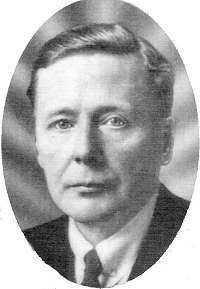 Joseph Toole, who conceived the memorial, had been Lord Mayor of Manchester in 1936-37. He was born in Salford in 1887 to parents of Irish ancestry, the eldest of thirteen children of Thomas and Ann Toole. According to his obituaries, began working at the age of 12 as a street scavenger in Manchester by day and as a newspaper vendor by night. He subsequently had various jobs, including working 73 hours a week in a cable factory, before establishing his own stationery business. 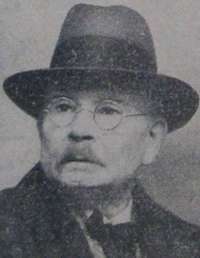 He joined the Labour Party, and was elected to Manchester City Council in 1919, being made an Alderman in 1935. In his spare time, when not reading political books, it is said that he enjoyed 'sitting in the "gods" in the great days of Manchester Theatre Royal and the Gaiety. No doubt, like Stuart and indeed Cassidy, he was a Roman Catholic; the reasons for his interest in commemorating Stuart once are clear. However, it would appear that the appeal for funds was not a great financial success, as the low-cost option of a bronzed plaster plaque had to be chosen, and Cassidy would not have charged much for his work under the circumstances. Sadly, the newspaper picture reproduced above is our only photograph of the work we have located; another Cassidy in the Central Library, a plaster bust of Charles Sutton, has also been lost, having been accidentally knocked off its plinth. Lime Grove, Leslie Stuart's home from 1887 to 1895, was in one of two pairs of semi-detached houses, 12-14 and 16-18 Lime Grove, probably built in the 1830s, when Lime Grove was being developed as what it was hoped would be an exclusive part of Chorlton-on-Medlock. However, the idea never really worked, as the area was too close to the expanding industries of the city. 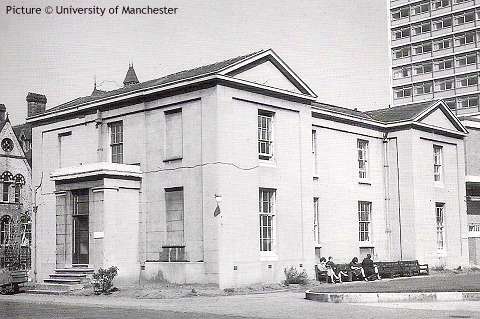 Later, the whole street became part of the University of Manchester, and remains so today. Nos. 16 and 18 were demolished by the 1930s to be included in the site of the Arts Library, but nos. 12 and 14 became the home of the Deaf Education Department, as seen in the picture above, dated 1960. Soon afterwards, Stuart's house (facing the camera in the picture) finally vanished as the site was used for a new structure which incorporated the Senior Common Room familiar for many years to the present writer. That building in turn was demolished in 2009-10, and as we write a new 'learning commons' building is being built on the site. 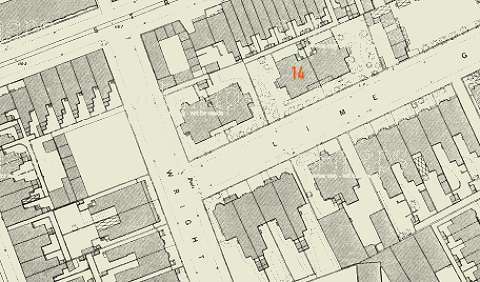 14 Lime Grove, from the Ordnance Survey town plan of 1891. None of the buildings seen here still exist in 2011. Lime Grove has been truncated and built over just to the west of the site of no.14, and Wright Street has vanished. No. 16-18, were purchased by the University and demolished to make way for the Arts Library built in 1936 (and known by 2011 as the 'green area' of the Main Library). The Arts Building of 1919 replaced most of the buildings on the south side of Lime Grove, although one, No. 15 (oppsite no. 14) survived for a while in University use. This had also had a show-business link as it had been a dancing school, the home of John Tiller, founder of the 'Tiller Girls' dancing troupe. Written by Charlie Hulme, March 2011. Updated December 2012.